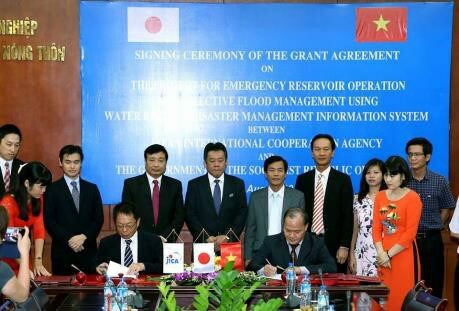 Hanoi (VNA) – A Japan-funded project on operating reservoirs in emergency and manage floods effectively using a comprehensive disaster management platform was signed in the capital city of Hanoi on August 10. Signatories were the Ministry of Agriculture and Rural Development and the Japan International Cooperation Agency (JICA). The project has a total investment of over 18.2 million USD, including 16.65 million USD (1.8 billion JPY) of Japan’s official development assistance. It will be carried out in 36 months since the signing of the Grant Agreement (G/A) was signed. It aims to mitigate human and property losses caused by rains and floods, contributing to sustainable socio-economic development via establishing a framework on operating reservoirs in emergency, developing a forecast system, and warning vulnerable areas along the Huong River in the central province of Thua Thien – Hue. The outcomes of the project will be applied for other river basins across the nation. Addressing the signing ceremony, Deputy Minister of Agriculture and Rural Development Hoang Van Thang said the ministry and JICA have piloted the development of flood management plans for Huong River’s basin. He expressed his hope that the project will not only supply equipment for forecasting and warning floods in Huong River’s basin, but also open up a new approach in terms of technology and flood prevention methods. Fujita Yasuo, Chief Representative of JICA Vietnam, suggested the ministry allocate sufficient budget to facilitate the implementation of the project while completing paper work for a number of the project’s activities.